Mother’s Ashes is the second last chapter of the story in God of War. You are pretty much done with all of the hard parts of the game, and all that is left are a few objectives. 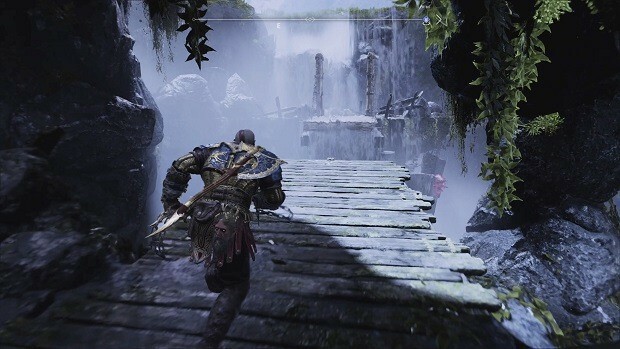 If you somehow are still unable to figure out how to progress, then this God of War Mother’s Ashes Walkthrough Guide is for you. By this time, you have done most of the things that were expected of you. The Jötunheim tower is back in its place and Mimir has both of his eyes. All you need to do is to fulfill the final wishes of your wife. To do that, you first need to make your way back to the Realm Travel Room. There will be a boat that you can use at the Northern Dock to get to the Realm Travel Room. However, you could end up saving a lot of time if you go down the slope to the dock and use the Mystic Gateway over there to get to Brok’s shop (temple). From here, it will be easy to get to the Realm Travel Room and use the travel able to make your way to Jötunheim. Atreus will automatically utilize Merman’s eyes to complete your travel. When the door opens, Mimir will ask you to leave him behind and Kratos and Atreus will be the only ones who head up the staircase. Brok and Sindri will promise to keep Mimir safe and will see you off. Climb the staircase to the top and use the bridge to enter the cavern opposite of you. Move through the cave and search for whatever gear and lore you can find. Soon, you will be at the opening of the cave and a cinematic will occur. In the cinematic, Atreus will realize why they had to make this journey. Once the cinematic ends, climb the ledges outside of the cave (examine the story on the wall before you do that) and follow the yellow markings until you are at the vista point, concluding the chapter. That is all we have for our God of War Mother’s Ashes Walkthrough Guide. Let us know if we missed something using the comments section below!